Actually, that happened the other way around, but whatever. Abe is taken away to serve his time for murder, the one crime Hawkeye can’t redeem them for without jailtime. However, Edwin Cord is convinced that they’re still bad guys and takes matters into his own hands by sending The Jury, now led by US Agent. They aren’t the only ones able to track the Thunderbolts. Charcoal finds them as well, looking to join up and also seeking redemption as he never wanted to join the Imperial States Of America but his dad forced him. Of course the Thunderbolts immediately go into defensive mode until Hawkeye can break them up just as the The Jury arrives. Hawkeye is able to get them all to work together to stop the Jury but they lose yet another base, which Citizen V had rigged to spy on them and Cyclone had tracked them because the new Masters Of Evil are worried about them. Despite not knowing the Masters are still looking for them Hawkeye declares on camera, to the surprise of both the Thunderbolts and Crimson Cowl, that they will prove they are heroes by bringing the Masters in! What they got right: More reforming villains! (Although as I stated in that last appearance he was killed off over rights issues some time later.) And we have more of the running gag of their headquarters blowing up but the heroes not realizing its to their benefit. What they got wrong: Hasn’t the Jury attacked actual superheroes and broken the law before? 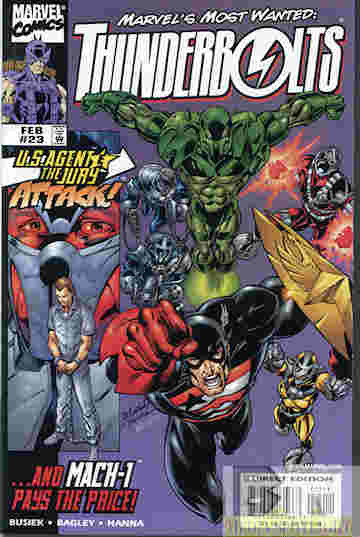 So they can be redeemed by sending US Agent (despite his own questionable activities) but the Thunderbolts can’t? Cord makes no sense, although that may actually be the point. At least Hawkeye calls Agent out on this. Recommendation: Still a run worth checking out. Posted by ShadowWing Tronix on August 14, 2018 in Marvel Spotlight, Yesterday's Comics and tagged Mach-1, Marvel Comics, Marvel Universe, Masters of Evil, The Jury, Thunderbolts, US Agent.